Almost a century ago, Mohandas K. Gandhi – commonly known by the honorific Mahatma, the great-souled one – emphasized nonviolent resistance in his campaign for Indian independence. Today, as my research shows, Gandhi has become an iconic figure for people seeking social change, including communities across the United States. For Gandhi, nonviolence was not simply the absence of physical violence. 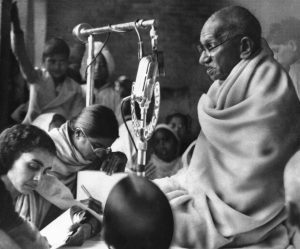 Self-rule and radical democracy in which everyone participates in the governance process were also part of Gandhi’s idea of nonviolence. He believed that self-rule should extend to all people, rich and poor, male and female, and at all levels of society. To him, authority over others was a form of violence. To achieve that vision, he encouraged participation of women and the lower castes in economic and political matters. These ideas about violence and authority had circulated in the U.S. in the 19th century, especially among the Christian peace churches such as the Quakers and Mennonites. In this view, equality and the lack of hierarchical structures are forms of nonviolence. For Gandhi, it was the Indian religions, Hinduism and Jainism, that shaped his activism. His mother, a devout Hindu, taught him the importance of fasting as a form of self-discipline and religious devotion. From the Jains, with whom he grew up, he learned nonviolence and nonpossessiveness. In particular, he drew on the Hindu text “Bhagavad Gita” (The Song of the Lord) for a religious framework on the values of simplicity, duty and nonviolence. All this translated into Gandhi’s peaceful expression of protest of which the most potent “weapon” was fasting. The Salt March of 1930 is one of Gandhi’s best-known acts of peaceful resistance. Under colonial rule, the British taxed Indians for salt and declared that making or collecting salt was illegal. Since salt is necessary for survival, this issue affected each and every Indian. They considered this law unjust and morally wrong. 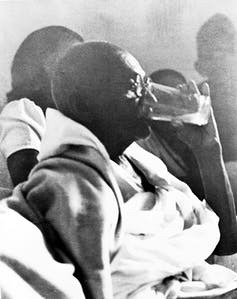 Gandhi organized a 241-mile march across western India to the city of Dandi in Gujarat, in western India, where he collected salt, illegally. He started with 78 people. But as the marchers proceeded, thousands more joined. Weeks later, his unarmed followers marched to a government salt depot, where they met violent retaliation. “At a word of command, scores of native police rushed upon the advancing marchers and rained blows on their heads…Not one of the marchers even raised an arm to fend off the blows. They went down like ten-pins. For Gandhi, resistance meant placing one’s own body in harm’s way, open to the possibility of injury, imprisonment or even death. And that is what made it such such a powerful political tool. 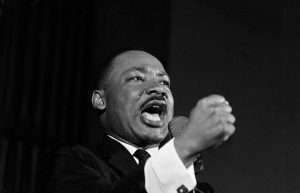 Years later, Martin Luther King Jr., who met with Gandhi, would employ similar ways of nonviolent resistance. Indeed, it was the visceral horror of what happened in the two countries that rapidly swung public opinion. During the Indian independence movement, descriptions of British clubs striking unarmed Indians in the Salt March drew worldwide sympathy. Back in the U.S., Americans watched with horror as Birmingham police set dogs upon African-Americans during a peaceful civil rights protest in 1963. This pushed President Kennedy to take action and eventually led to the Civil Rights Act of 1964. 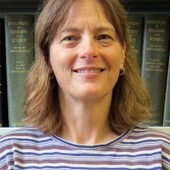 In my research, I found many communities in the U.S. replicating Gandhi’s model: Possibility Alliance in La Plata, Missouri, and Cherith Brook Catholic Worker House in Kansas City, Missouri, are among those who have used nonviolent protests to raise their voice against racial and economic injustices. But, for others, as we have seen in recent months, keeping protests peaceful can be difficult. There were reports, for example, of violence during protests on college campuses and rallies against or in support of President Trump. The Black Lives Matter movement has been accused of rioting, for example, in Baton Rouge where members blocked intersections.